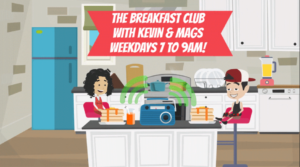 The Breakfast Club with Kevin and Mags weekday mornings from 7am-9pm! They’re like your best friends, just having a chat over a cuppa, a laugh and providing great craic. We’ll serve up the perfect start to your day with a mix of good humour, entertainment, competitions, Kids Talk, great music plus all the local news, traffic and sport and a guarantee that you’ll be smiling by the time you reach work, school or have the children out to school for the day. Kids Talk is brought to you by the twins from Ballinaglera, Abbie and Millie! The girls give you tricky clues every day to guess what the kids these days are talking about! Tune in to guess and win great prizes for all the family!